Since we cannot hear the Little Brown Bat’s, or most other bats’, calls, it is very hard for humans to distinguish different species of bats when observing them flying at nightfall. Special equipment, like a “bat detector”, is needed to process their echolocation calls. Even properly equipped, it is difficult to differentiate them. The three Canadian Myotis species all make a similar clicking noise at a 40 kHz frequency, making them hard to tell apart. Still, there are minute differences in frequency and patterns. The Little Brown Bat typically produces calls lasting about 4 milliseconds. 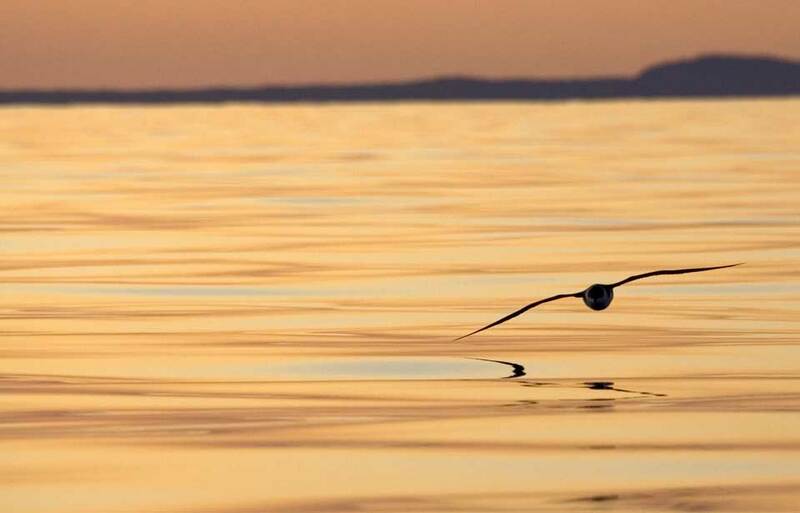 When not feeding, they make echolocation calls about 20 times per second. 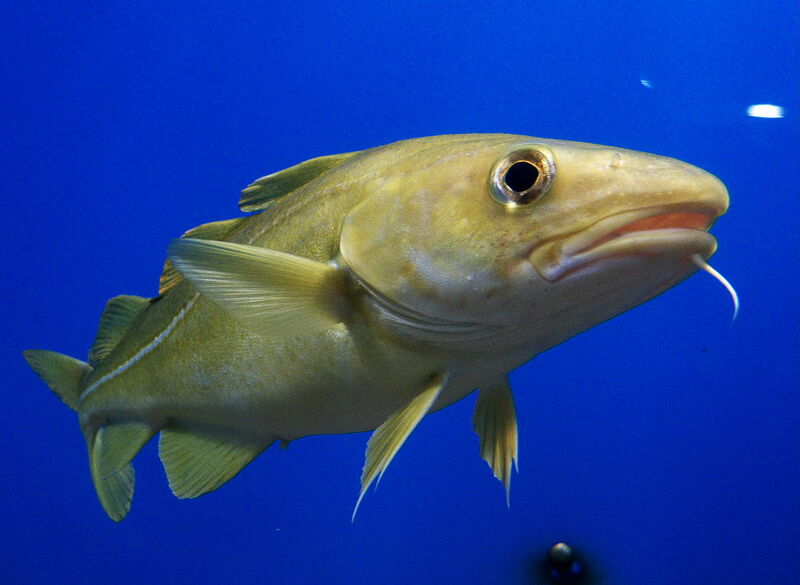 When hunting, they can emit as many as ten times more calls per second. The Little Brown Bat has a very long lifespan compared to other small mammals. 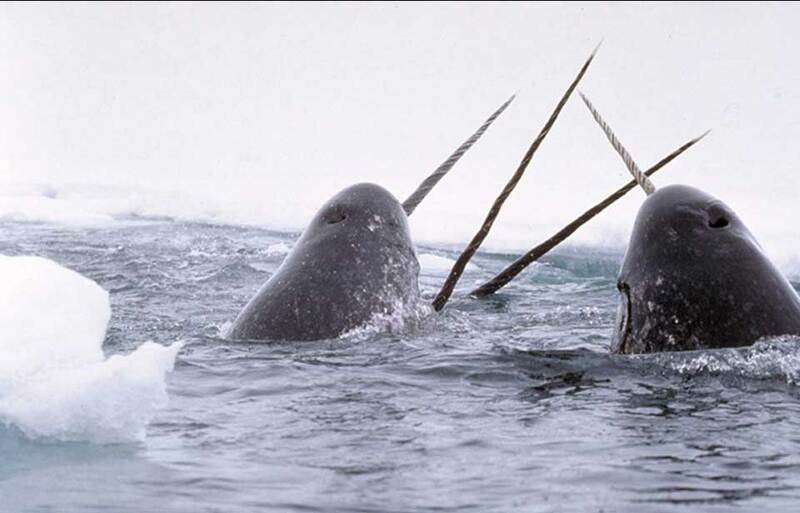 They can live for more than 10 years, and one was even captured at 34 years old! 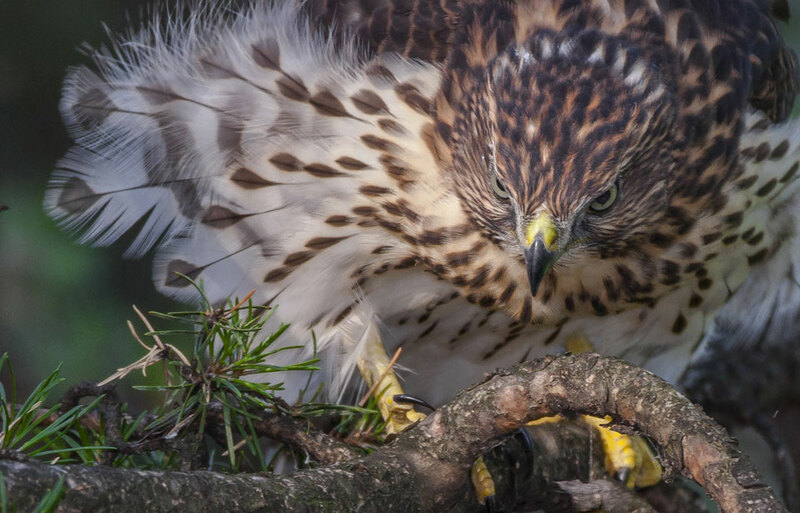 Owls, snakes, raptors, cats, raccoons, and weasels have been known to prey on the Little Brown Bat both when it is roosting and in flight. 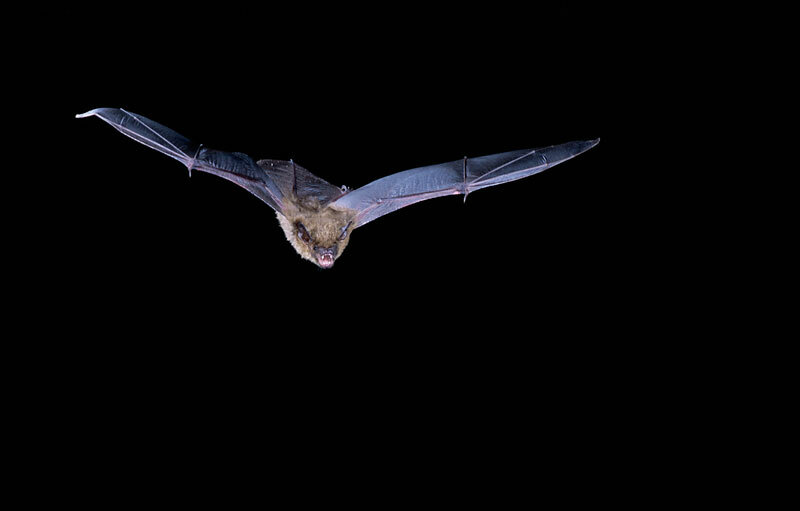 Bats like the Little Brown Bat are the only mammals capable of true flight. Some Canadian bats migrate long distances south in the fall and north in the spring, just like birds. However, this is not the case for the Little Brown Bat, which does not migrate. 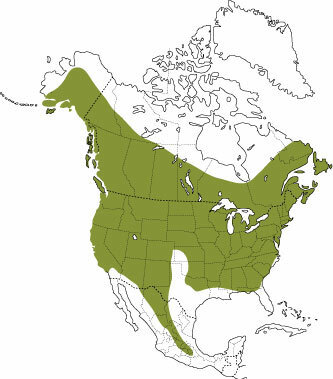 Other Canadian bat species also remain here, like the Big Brown Bat (Eptesicus fuscus), the Northern Myotis (Myotis septentrionalis), and the Tricolored Bat (Perimyotis subflavus). 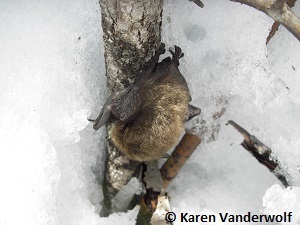 Even though Little Brown Bats do not usually migrate to destinations outside of Canada, individuals can move up to 1000 km from summer roosts to winter roosts where they hibernate. These winter roosts are called hibernacula. 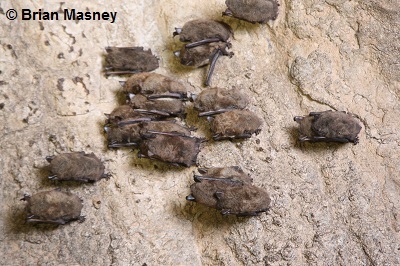 Between August and early October, individuals from many different summering locations swarm together in large groups during the night in mines and caves in order to mate. This swarming behaviour prior to winter also helps direct yearlings, or bats born the preceding summer, to suitable hibernacula locations. Most Little Brown Bats remain in the same areas where they swarm for the winter, but others move to different locations. Hibernacula are generally in caves or abandoned mines, and are chosen for their high humidity and stable, above-freezing temperatures. The Little Brown Bat is a true hibernator (it slows down its metabolism, heart rate, and breathing) but still wakes periodically to drink or eliminate waste. 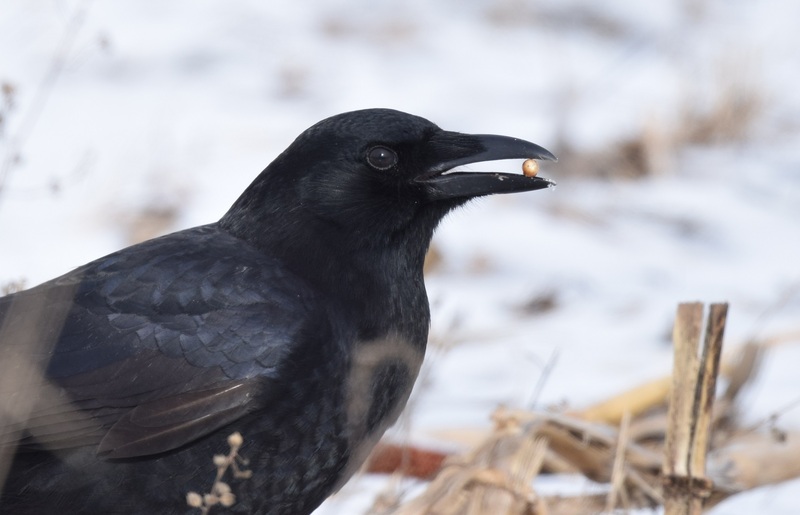 Because food is not available during the winter, it relies solely on its fat reserves to survive from as early as September to Mid-April (for females) or Mid-May (for males). The duration of hibernation is longer in colder latitudes and shorter in the south. In the spring, female Little Brown Bats that mated the preceding fall or during the winter wake early from hibernation and move to maternity, or nursery, roosts, where they will remain for the summer in groups of up to a thousand individuals. In Canada, Little Brown Bats and Big Brown Bats are the only two species that regularly use buildings for their maternity colonies. They may also use tree cavities or other places that stay dark and warm during the day, like bat boxes. The fact that they huddle together and choose warmer spots is thought to help the pups grow more rapidly. 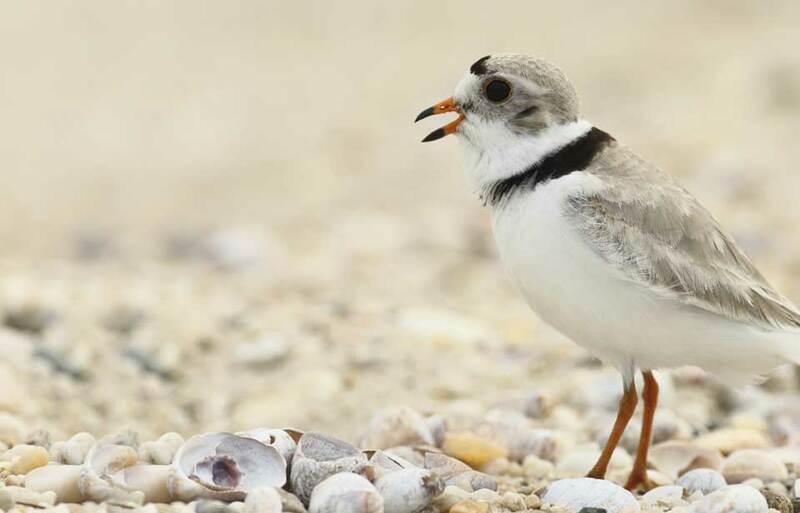 Females that are not reproducing and males roost in other, typically cooler, locations, in smaller groups. 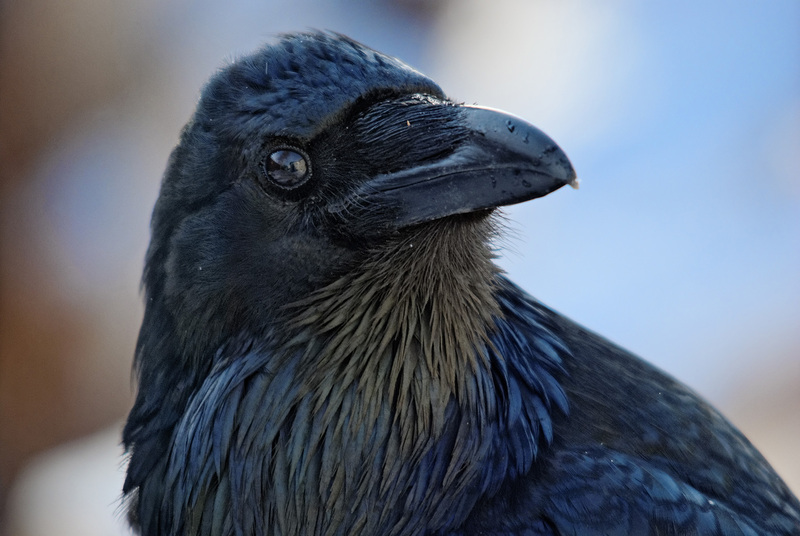 In both cases, these roosts are mainly used during the day, since Little Brown Bats forage, or hunt, at night. At night, Little Brown Bats may use night roosts to rest between feeding bouts. Most Little Brown Bats keep returning to the same mating, wintering and nursery or summer roosts every year, although roost switching does happen. 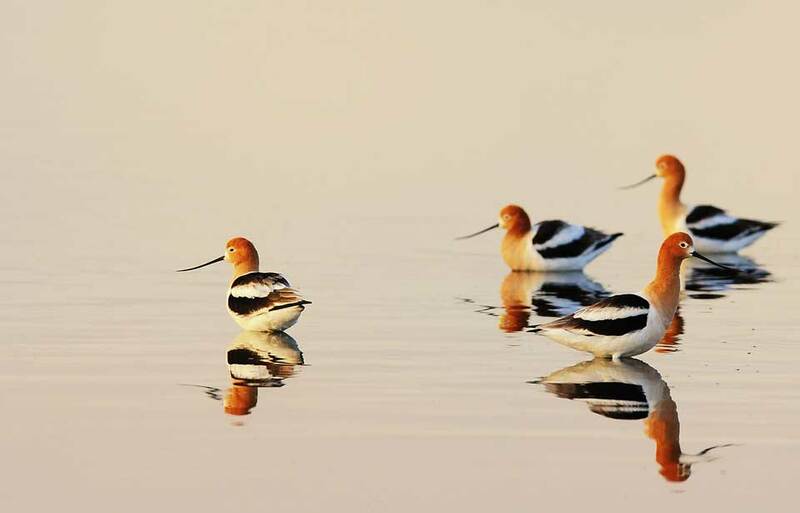 The species has been observed in a great variety of habitats, including all forest types, the southern edge of the Arctic tundra and urbanized areas, but it prefers areas close to wetlands, lakes or streams in the summer because of greater food availability. The Little Brown Bat has the largest distribution of all Canadian bats. 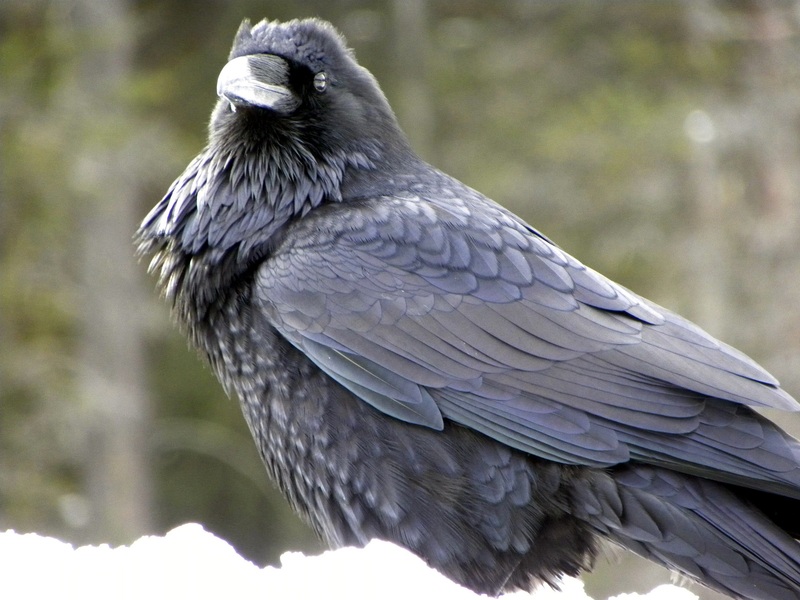 In Canada, it is found in all provinces and territories except Nunavut. 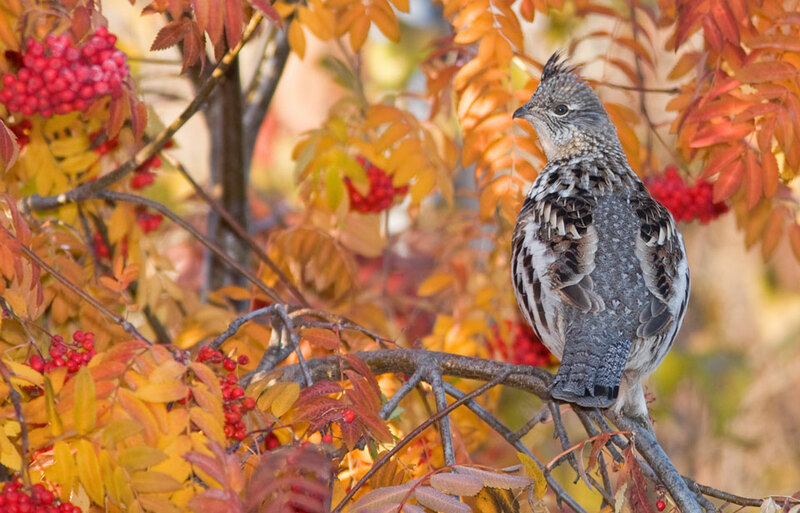 It is most common in the northern half of the United States but has been observed in all continental states and Alaska. 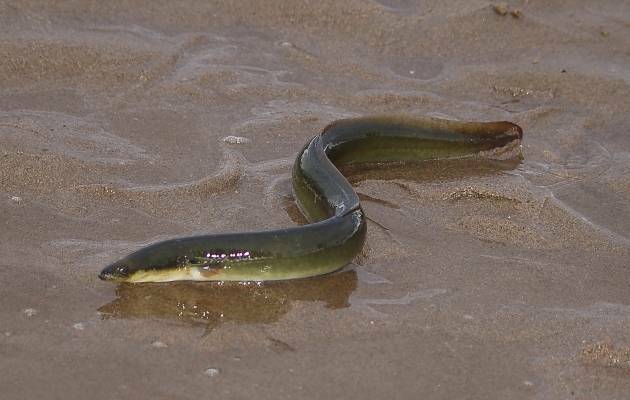 It is also found in the cooler mountainous areas of central Mexico. 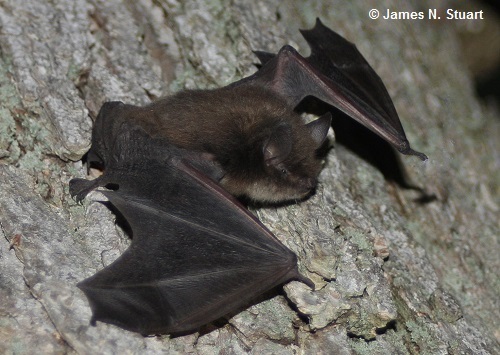 Little Brown Bats feed on a great variety of small, flying insects. 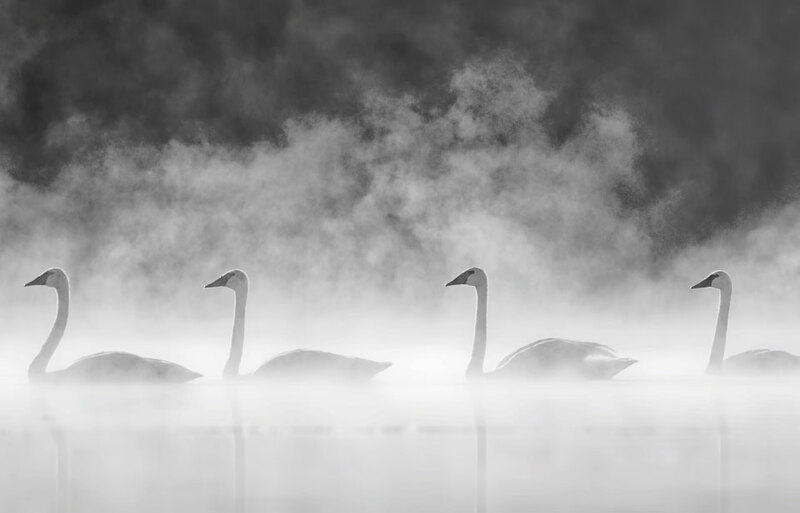 They locate these insects using echolocation. 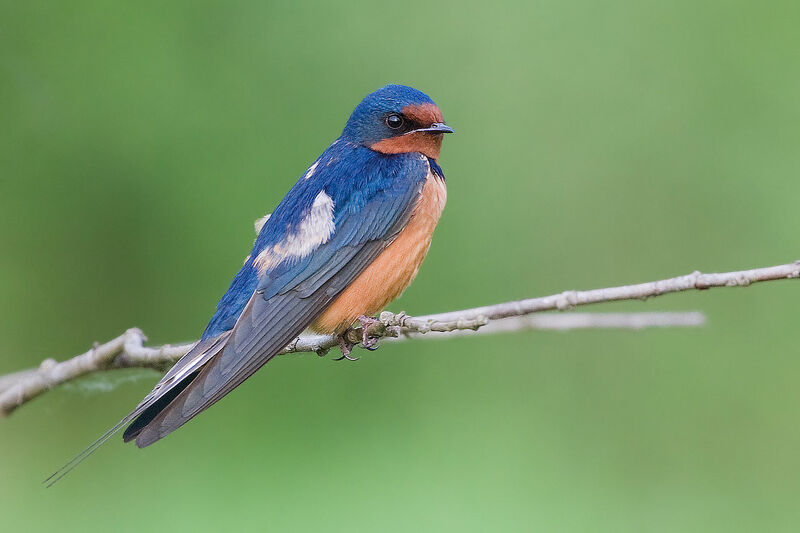 These are typically moths, flies, mosquitoes, mayflies, beetles, and midges, but they are opportunistic feeders, meaning that they feed on whatever insect species is available. 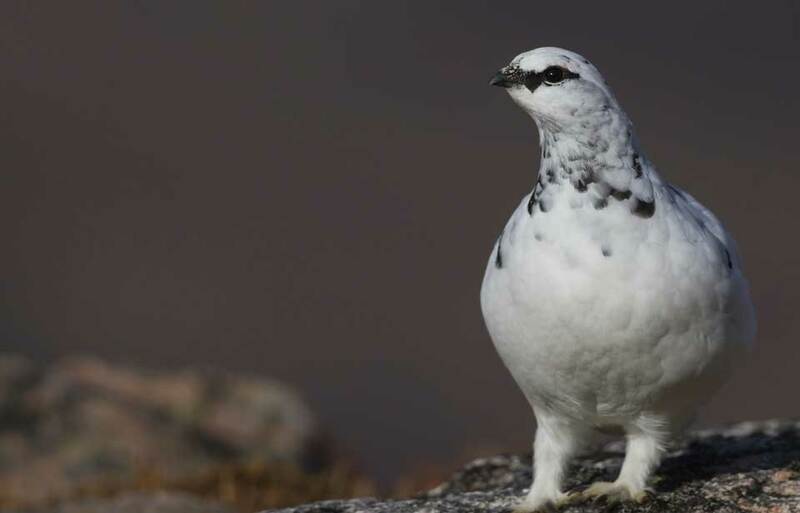 They tend to go on two or more feeding bouts per night, one at sunset and the other before sunrise. In between they will rest to conserve energy and digest their food. Pregnant females tend to feed over larger areas, but as soon as the pups are born, they stay closer to the maternity roost. Females that are suckling their young can consume the equivalent of their weight in insects each night. Still, most Little Brown Bats consume about 1000 insects per night, or half of their body weight. 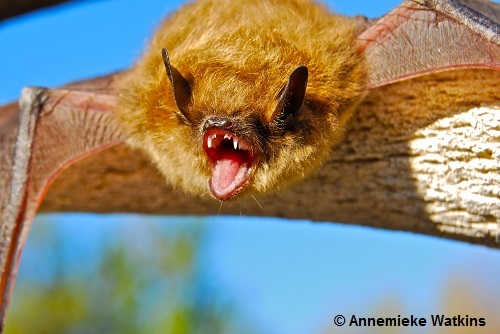 Before hibernation, bats will eat greater quantities, increasing their weight by over 30%. 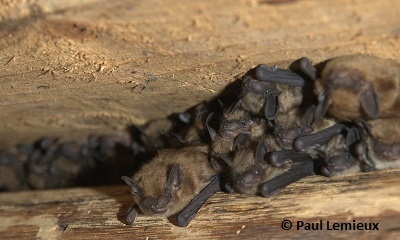 Most Little Brown Bats of more than one year old will mate in the fall when great groups swarm together. 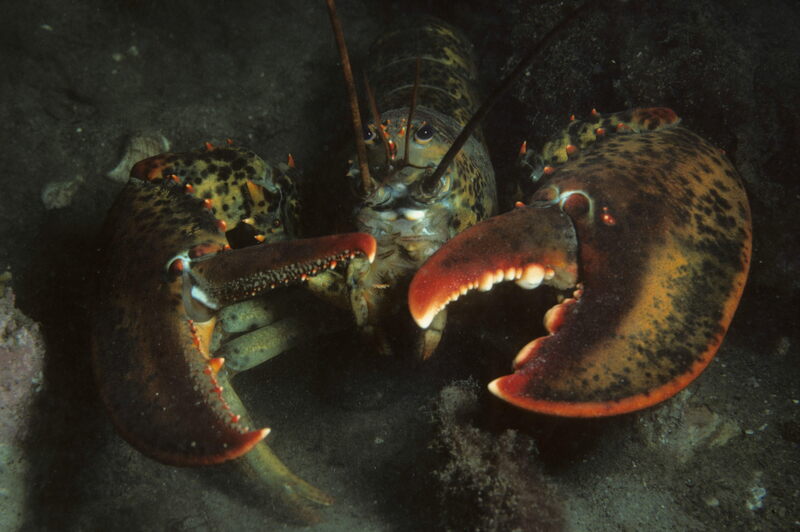 Individuals can mate several times with different partners. 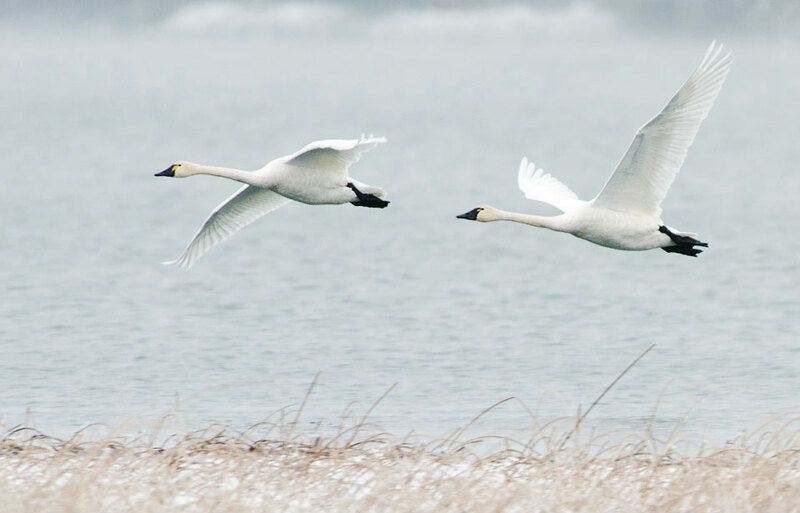 Females will store the males’ sperm throughout the winter until they ovulate in the spring. After a gestation of 50 to 60 days, depending on the condition and age of the female, a single pup is born in June or July. 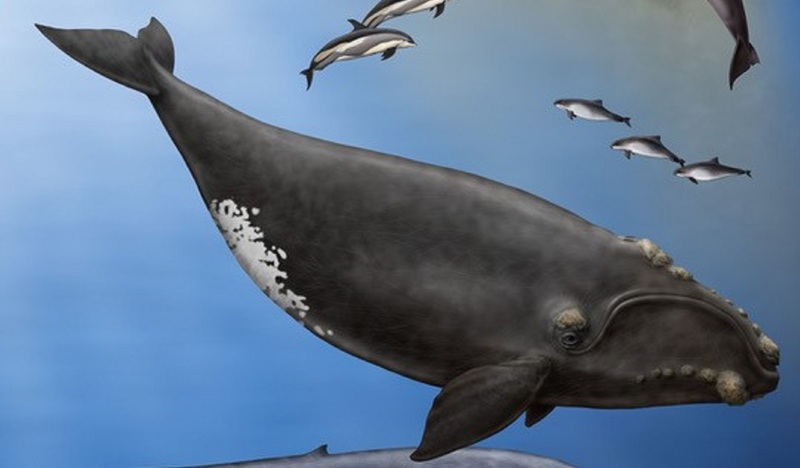 This pup weighs about ¼ of its mother’s weigh. 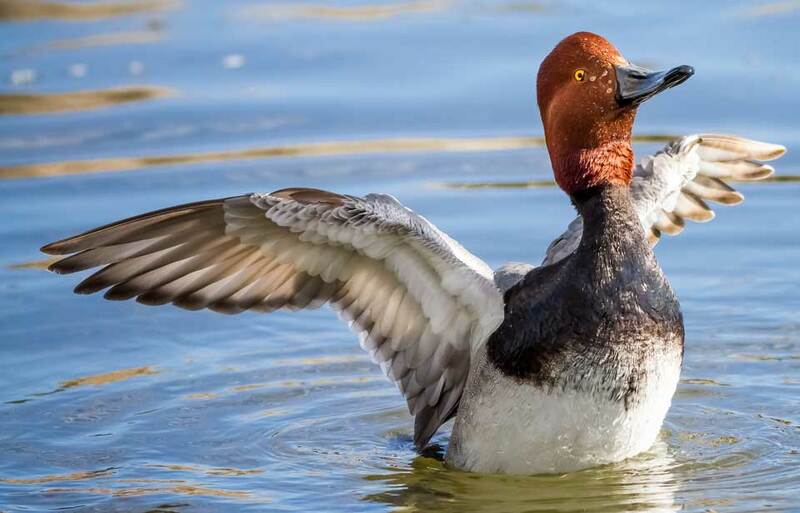 It is born able to cling onto the roost’s wall and its mother, even when the mother flies around while feeding. Little Brown Bat pups can fly at about three weeks old, after which it feeds both on its mother’s milk and insects. 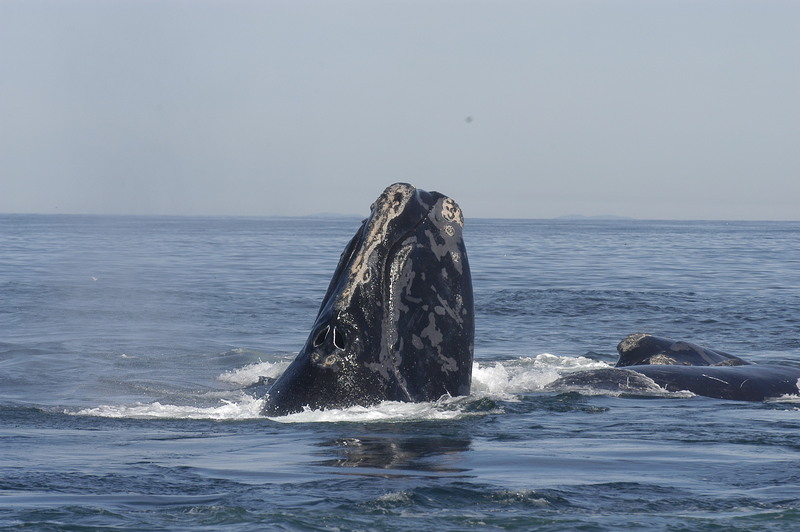 It is weaned from its mother’s milk at around 26 days, after which it accumulates fat for the winter before leaving for fall swarming sites. 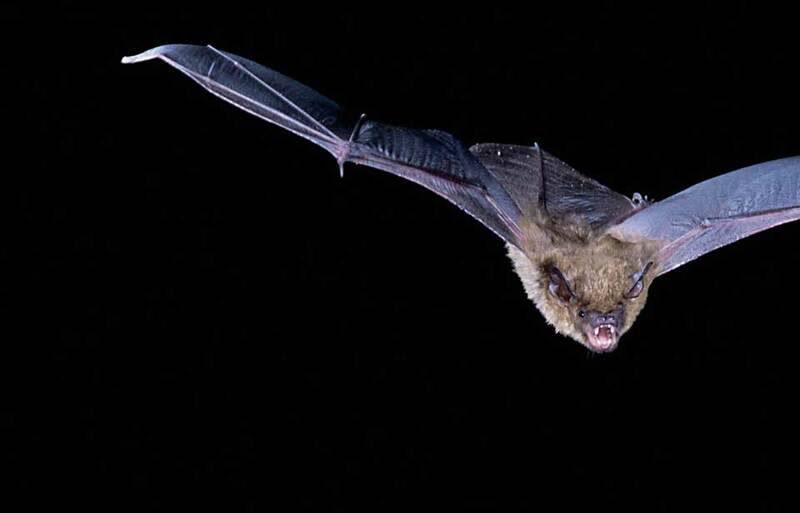 In 2006, a major threat for Little Brown Bats appeared in North America. A fungus called Geomyces destructans was likely brought over by cave explorers, or spelunkers, who may have carried dirt from European caves on their gear. When they afterwards visited a cave near Albany, USA, spores of the fungus were deposited. Since the cave had good growing conditions for the fungus, it survived and spread. In Europe, researchers believe that bat populations have survived alongside the fungus for thousands of years, and so have developed immunity to it. 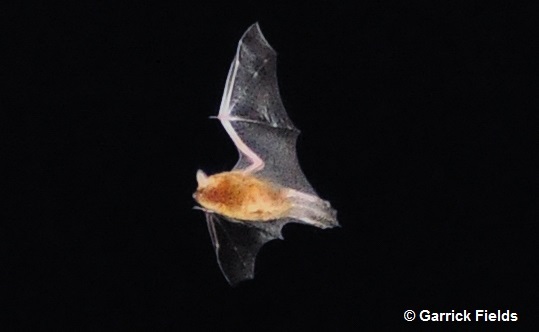 At least, a great majority of affected European bats survive an infection from Geomyces destructans. In North America, where bats had never encountered the fungus, the reaction is quite different. Geomyces destructans causes a disease called White Nose Syndrome (WNS). 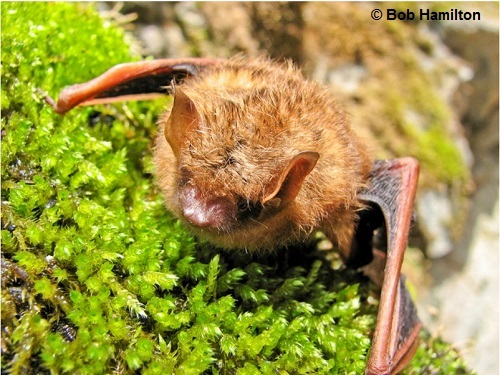 This disease affects three bat species in Canada, where WNS appeared in 2009-2010: the Tri-colored Bat (Perimyotis subflavus), and the Northern Myotis (Myotis septentrionalis), but the Little Brown Bat has been affected the most. The fungus grows on the bats’ nose (causing it to become covered by white fuzzy growths, hence the disease’s name), wings, and any non-furred skin during their hibernation. This causes the bats to wake more often than usual due to dehydration and possibly to groom the fungus off. 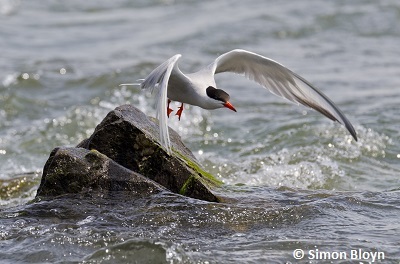 Because they become more active than they should during the winter (some are even seen flying outside their hibernaculum), they rapidly use up the fat reserves they had gathered the preceding summer, which causes them to starve as well. 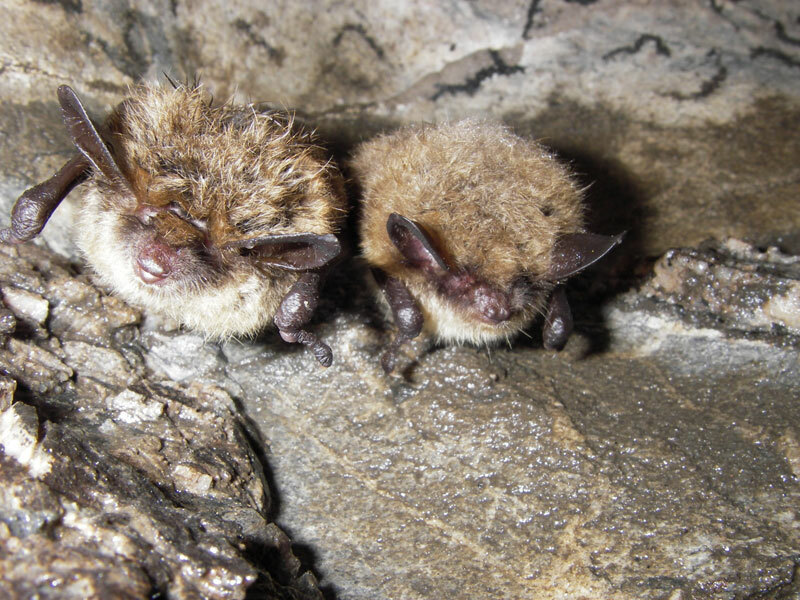 The great majority of Little Brown Bats that have WNS are unable to survive: after two years of infection, bat populations in some hibernacula have been reduced to less than 10% of what it originally was before the disease’s onset. 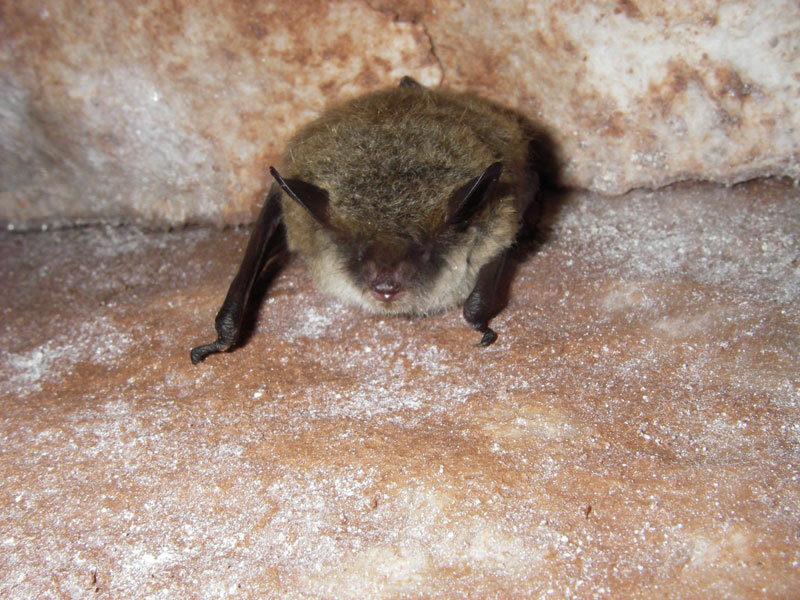 Since conditions are ideal for the fungus in most Canadian bat hibernacula – caves and mines share similar cool and humid conditions –, WNS is spreading fast. Since Little Brown Bats may travel for hundreds of kilometres from summer to winter ranges, and since they swarm in the fall to reproduce, the disease is transmitted from bat to bat over very large areas. Bats that survived the infection the preceding year can potentially transmit the fungus to others by contact during swarming or by entering new hibernacula. 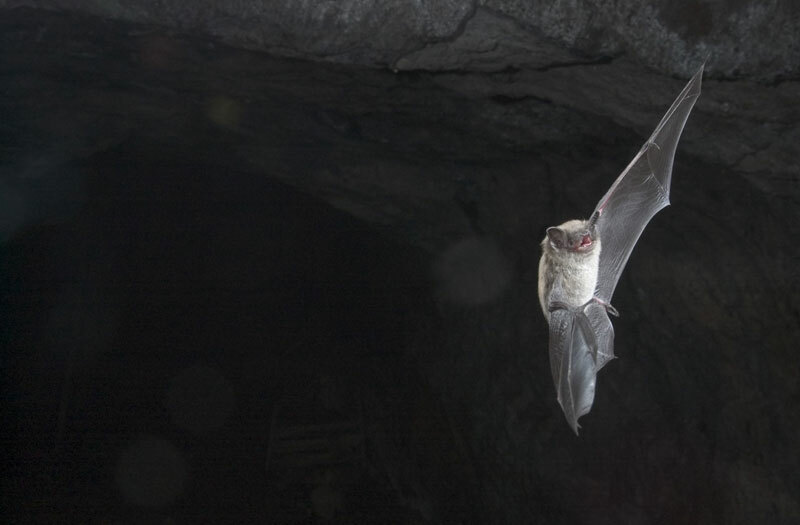 The fungus is able to survive in hibernacula during the summer when bats are absent, potentially re-infecting bats on their return in the fall. 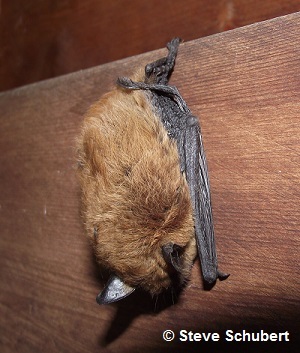 So far the disease has only infected bats in Eastern Canada (New Brunswick, Nova Scotia, Québec, Ontario, and Prince Edward Island), but experts believe that most of Canada (except, perhaps, the colder areas in Northern Canada in which a small proportion of Little Brown Bats hibernate) will have infected Little Brown Bats within 22 years. Since no cure for WNS has yet been found, experts say that the Little Brown Bat will likely be extirpated, which means that it will become extinct in some areas of Canada. It is probable that less than 1% of the original Canadian population will remain. In North America, 5.7-6.7 million bats have died of WNS since 2006, and in the Northeastern states, the Little Brown Bat will likely become extirpated within about 16 years from the disease’s onset. We can expect a similar situation in Canada within about three generations of bats, or between nine and 30 years. 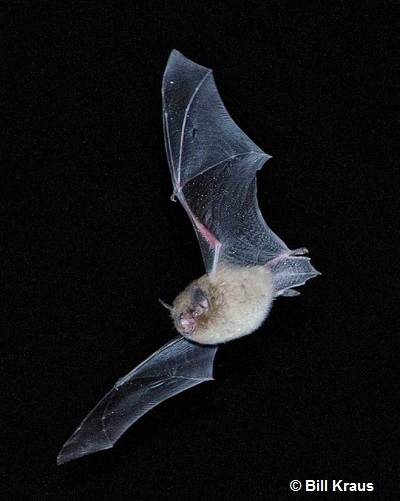 Although it is likely that very few Little Brown Bats that will remain isolated from WNS, scientists hope that the species will not become totally extinct in Canada because of the survival of some individuals from the disease. Indeed, a small percentage of bats have been known to survive after showing symptoms of WNS. These bats, when breeding, may transmit their immunity to the next generation, as might have been the case for European bats initially. Still, since the Little Brown Bat is one of the slowest reproducing mammals for its size, only giving birth to one pup per year, the recovery of the species in North America, if possible, will very likely be slow. Little is known about the distances and areas bats travel between summer and winter roosts, hibernacula locations, and bat population numbers in Canada. However, since the arrival of WNS experts have been busy gathering as much information as possible. A more thorough knowledge of basic bat biology will likely help managing WNS. The locations of bat hibernacula need to be discovered in order to gather this information and document how populations are affected by WNS. 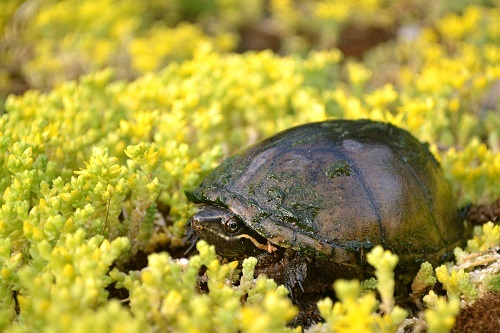 The Canadian Wildlife Federation is currently funding researchers in Eastern Canada, enabling them to study the disease and document its spread. 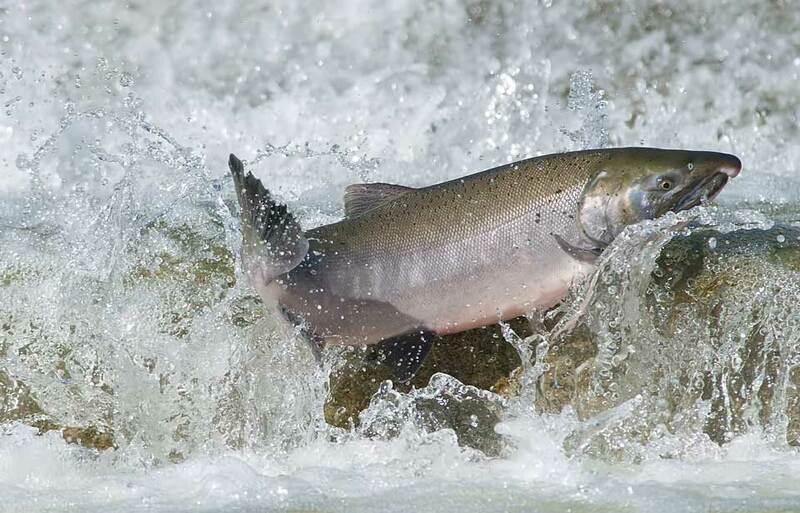 Environment Canada funds the coordination of activities related to the management of WNS in Canada. Also, scientists in Canada and the United States are trying to find a cure for WNS by studying European bats and the fungus itself. 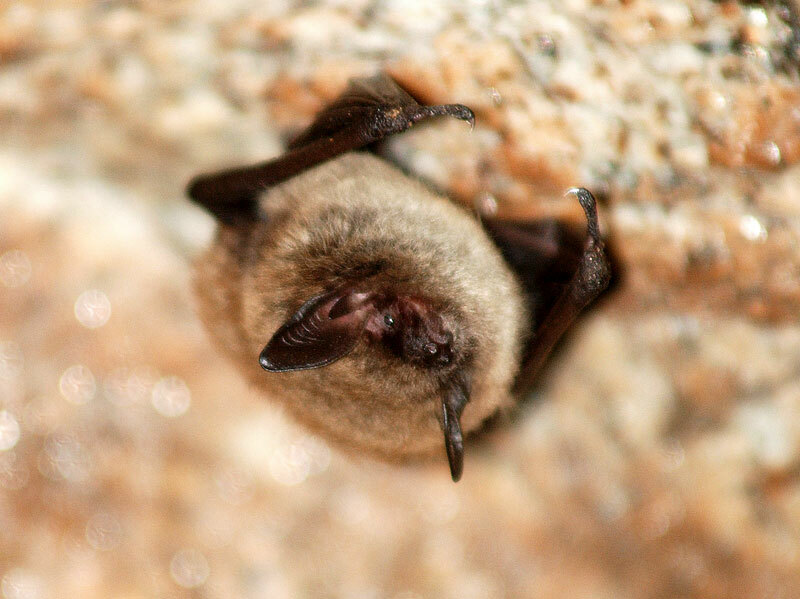 Other threats to the Little Brown Bat include the disturbance or destruction of hibernacula and maternity colonies, habitat loss, the use of pesticides and presence of toxins in the food web. 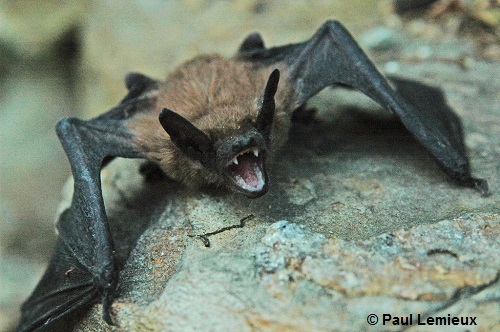 Because of these threats, but above all, the presence of WNS, the Committee on the Status of Endangered Wildlife in Canada has assessed the Little Brown Bat as Endangered in Canada in an emergency designation. 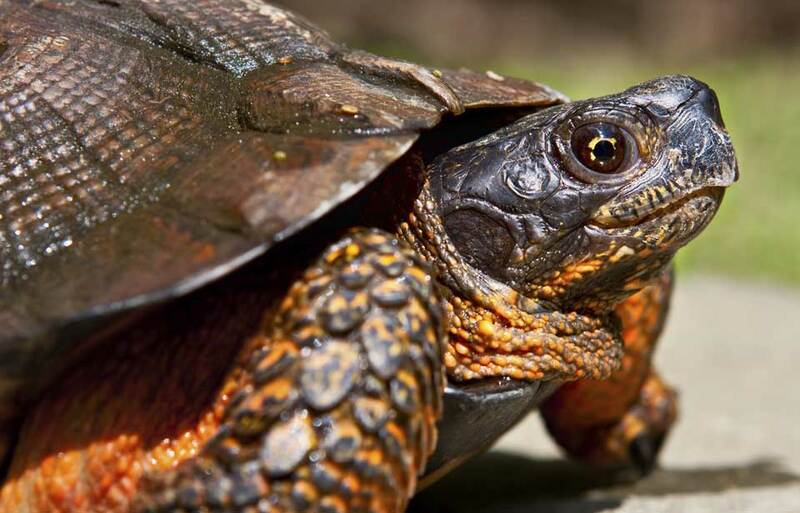 The species is already listed as endangered in some provinces. Little Brown Bat conservation is, of course, very important. 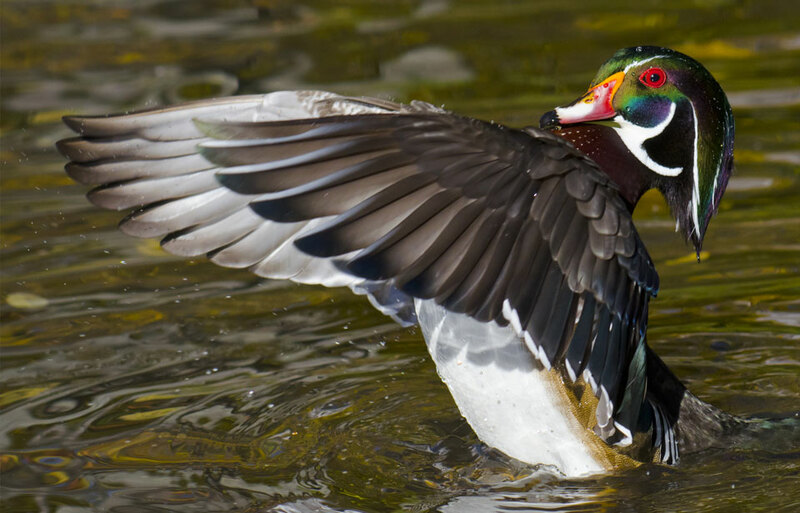 As a part of the biodiversity of many Canadian ecosystems, they contribute to the ecological functions of many types of forests and wetlands. 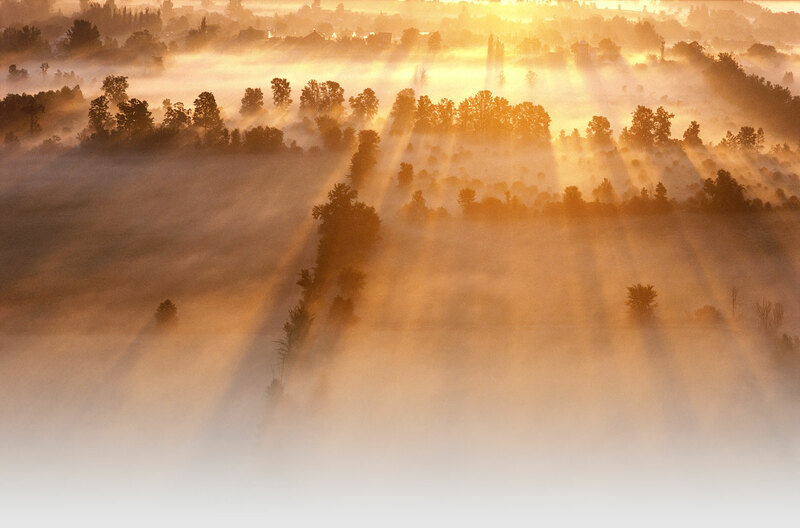 For example, they help keep forest pests’ populations under control. But bats such as the Little Brown Bat, are also important for human health. Since these bats eat a great quantity of pest insects such as mosquitoes, which can be vectors for illnesses, they help humans enjoy the outdoors more during the summer months and might even play a role in reducing the spread of diseases. Also, a healthy bat population is good for the economy, since they consume insects that are destructive to crops and forests, reducing the need for pesticide use. Fortunately, there are a few things you can do to lend a hand to the Little Brown Bat and other bat species in Canada. Cave visitors that do not properly decontaminate their equipment have probably contributed to the spread of WNS. A very easy way to help reduce this threat is by not visiting non-commercial caves at all unless you are accompanied by experts. Also, leaving caves where bats hibernate undisturbed will give even healthy bats a boost, since being awakened during hibernation lowers their chances of survival. Also, when gardening or caring for your lawn, use no pesticides, since they can get into the bats’ system through their insect diet. Building and installing a bat house can also help bats find a suitable resting spot during the summer months. If you find bats in your home, contact a licensed person that is equipped to properly and humanely deal with them. Also, if you ever notice active bats during the winter months or dead bats around your home, contact your provincial wildlife management bureau, since they likely know bat experts interested in the information. White Nose Syndrome in the U.S.